Bananas Foster at Julep's New Southern Cuisine. 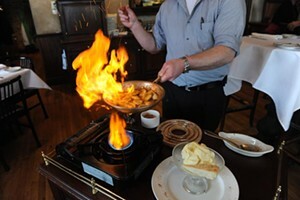 Flaming bananas Foster prepared tableside at Julep’s New Southern Cuisine in Shockoe Bottom (pictured). Cinnamon added to the liqueur makes the dish snap, crackle and scare surrounding tables — and everyone wants a taste. Fried Twinkies at Buffington & Wine’s Pies, Fries and Franks in Church Hill. Elvis pizza at Fresca on Addison: peanut butter, bananas and chocolate on a thin-crust pie. Bacon ice cream and apple dumplings at Parkside Cafe. Molten lava cake at Zeus Gallery Cafe.